This year marked the 15th anniversary of the Honolulu Festival. There were more participating groups from Japan and other countries of the Asia-Pacific region. Specifically, the groups from Australia, Philippines, Korea, Alaska and Hawaii participated this year. Each of them performed their traditional culture. 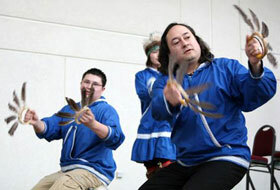 The members of the Alaska Native Heritage Center Dancers from Alaska participated for the first time. Their mission is to pass down the traditional culture of Alaska to the next generation. It is known that the State of Alaska was the 49th state to join the union and also, Hawaii became the 50th state of the U.S. in the same year which has a similar history. The Alaskans are inheriting their traditional music and dance in their indigenous languages. Although it is not well known, there are 20 languages spoken in Alaska. The performers wear a headdress which is made out of hair of wolverine. They portray Alaskan traditional lifestyles and lives of animals in their local language through traditional dance using feather ornaments along with the sound of drums. Each hand motion carries a meaning similarly to Hawaii’s hula. It was a great opportunity for people in Hawaii to experience the traditional culture of Alaska. Also, Manoa DNA participated from Hawaii this year which is a family band consisting of Lloyd Kawakami and his two sons Nick and Alex. Their friend Mark also performed on stage. In addition, Pat Kawakami, who is the aunt of Manoa DNA performed hula which excited the audiences. 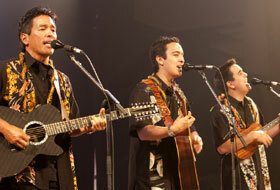 This band was formed in 2005 and affiliated with Hawaii Tourism Japan from 2007. The song Only in Hawaii composed by Alex was used for the campaign of Hawaii Tourism Japan this year. Manoa DNA is well known in Japan as well, which one of their popular covers Nada Sōsō (Great Tears Are Spilling) performed by Nick in Hawaiian style is touching beyond borders and generations. The group Dance Junction Hawaii is also from Hawaii, which consisting of students from elementary through high school. Unlike traditional hula, they fascinated the audiences with their beautiful contemporary dance. During their performance, the members of Ibaraki City Dance Drill Team World Wings were cheering from the audience seat. Afterwards, the two groups exchange with one another. Also, the Chamber Orchestra of Prince David Kawananakoa Middle School participated from Hawaii as well. Their skillful yet relaxed string performance was wonderful. 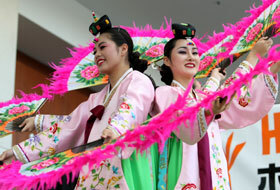 Furthermore, Chum-Sa-Rang is a group in Honolulu that spread Korean traditional dance. The members performed such a beautiful and graceful dance. They wore a beautiful traditional Korean dress called hanbok and danced to the sound of drums with their smiles, which brightened up the stage. Tahiti Nui International, a Hawaii-based group performed such an energetic Tahitian music and dance. This group hosts a Tahitian dance competition called “Heiva Honolulu” on March every year. Their mission is to preserve and pass down Tahitian culture to the next generation. This year marks the 7th anniversary of Tahiti Nui International, which their competition was held at the Waikiki Shell in Kapiolani Park for 3 days on March 12 through March 14. Also, the group held a workshop and participated in the Craft Fair, where there were many shops of their handmade crafts and artworks at the venue. In addition, Heiva Honolulu is the largest Tahitian dance competition outside of Tahiti, where dancers participate from the U.S. mainland, Japan and Canada. It is held around the same time as the Honolulu Festival. Also, the members of Tiare Heipua, the Tahitian dance team from Ishikawa Prefecture led by Minako Heikapua Sabarsah gave their performance at our festival. This team has received numerous awards over the past years. Their drum dance called “‘ote’a” was wonderful which made the venue very lively. This year, Montessori De Cagayan Dance Troupe and Kalayaan Philippine Dance Theatre participated from the Phlippines. 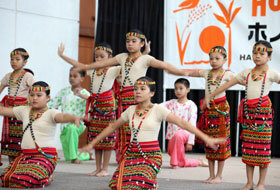 Montessori De Cagayan is a group of dancers from age 9 to 11 which performed folk dance and hip hop dance this year. Their dance and expression were marvelous which those dancers were just as advanced as the adult dancers. The dancers of Kalayaan Phlippine Dance Theatre wore a beautiful dress and performed their dance which portrayed the old days of the Philippines when it was under the Spanish rule. Also, they expressed the lifestyle of the indigenous Filipinos, where they were mainly fishing and using coconut shells for crafting. One of their dances was very cheerful as well. In addition, the groups from the Filipino communities in Hawaii such as BIBAK Hawaii, UHM Katipunan- Tekniqlingz Dance Crew participated as well. 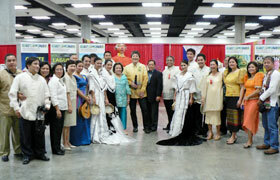 It was wonderful to see the interaction between the Philippines and its local communities to preserve their culture. 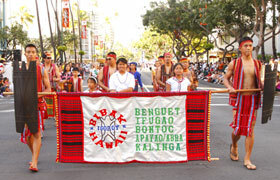 There were many participating groups from the countries of the Asia-Pacific region at the 15th Annual Honolulu Festival. They introduced various traditional cultures which made the cultural exchange possible. Please look forward to the 16th Annual Honolulu Festival as well.